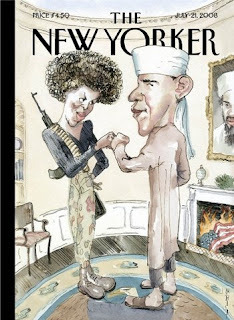 David Remnick, editor of the magazine, as well as the illustrator and various other staff and defenders have called this "homage to bigotry and ignorance " a "satire" of the noxious attitudes many bigots have toward the Obamas, husband and wife. Putting the kindest face on this propagandistic, anti-Obama campaign poster, we might accept that Remnick, his colleagues and supporters do believe it is satire. It is not. You don't send up someone else's ideas about X and Y by portraying without a trace of irony X and Y as the embodiments of those ideas. This drawing simply says, "Everything you feared about us was, in fact. true--and then some. " A poll released by the AP on July 24, shows that 7 in 10 Democrats feel the cover is a biased, bigotted piece of work that can't be called satire, while 7 in 10 Republicans find it fine--surprise, surprise. As any number of pundits has observed, there surely are "more" important things to worry about than what a magazine sliding past its glory years into dotage puts on its cover--surging oil prices, a housing market dragging the economy into a black hole, bank failures, American war crimes, not to mention the wars in Iraq and Afghanistan--the "Global War on Terriorism." But the sad truth is that this election is about whether America can in 2008 elect a black man president, whether enough people can determine to throw off the weight of America's racist history--the legacy of slavery, the reality of racism in a society that likes to inarcerate its black men--and vote for the Obama. The New Yorker cover and the pieces inside, including a long article on the Obama as a young Chicago politician--I should say ambitious young Chicago politician--are just more evidence of how hard that will be. If not precisely a hack job, theNew Yorker profile by Ryan Lizza is at best a weed whack job, negative in pitch, tone, and direction, perfectly in tune with the cover art. In discusssing the Obama, many reporters annd commentators in the main stream media and in the blogosphere add those extra, freighted modifiers at every naming--"arrogant," "elitist," "weak," "unproven," "opportunistic," "indecisive. ""aloof," "perceived as lacking gravitas," and "lucky." I even heard one talking head--a dead white male--call the Obama an Oreo cookie! The Obama said to be a brilliant speaker, but that is dismissed as little more than play acting. Words don't mean anything, the Hills liked to say, and, indeed, they mean nothing to people who's definition of truth is highly fungible. George W. Bush was less prepared for the presidency than the Obama, and, although he certainly was accused of many things, including arrogance and ignorance, he came in for far less flack--indeed, he did well in the debates precisely because he persuaded the media to give him a "gentleman's C<" plus extra points for every partial al answer. Applied to the Obama, thse words and phrases--whether consciously or not on the part of the writer, and I suspect that in many cases they are unconscious--serve the Obama is an uppity black man, and Michelle Obama is an even more uppity black woman. It's no wonder polls say he doesn't connect with most voters or share their values. My point is that when all of these comments are put in context of race, they spell defeat for Obama and Democrats to a man who is probably less qualified than George Bush to be president and nastier than Bob Dole ever dreamed of being. Add to that constant background, the media's blind allegiance to the general narrative line it has embraced--in this case that the surge and splurge in Iraq has been a glorious success. Juan Cole thoroughly dismantles that argument in his blog, but few journalists bother with specialists when they can talk to each other. In this case they use John McCain't as their authority and so regularly pound the Obama with a lie for refusing to accept that lie. But that's another blog. Even my skeptical friends think the Obama can win if he mobilizes a huge vote. I don't think the Obama is anything more than a moderate in terms of policy, but he has charisma to spare, and that might carry him through. I'd rather see him be as bold in terms of policy as he was in undertaking this run for the presidency.